From the main problem, the dynamic equations in the Laplace domain and the open-loop transfer function of the DC Motor are the following. Now let's design a controller using the methods introduced in the Introduction: PID Controller Design page. Create a new m-file and type in the following commands. Let's first try employing a proportional controller with a gain of 100, that is, C(s) = 100. To determine the closed-loop transfer function, we use the feedback command. Add the following code to the end of your m-file. Now let's examine the closed-loop step response. Add the following commands to the end of your m-file and run it in the command window. You should generate the plot shown below. You can view some of the system's characteristics by right-clicking on the figure and choosing Characteristics from the resulting menu. In the figure below, annotations have specifically been added for Settling Time, Peak Response, and Steady State. From the plot above we see that both the steady-state error and the overshoot are too large. Recall from the Introduction: PID Controller Design page that increasing the proportional gain Kp will reduce the steady-state error. However, also recall that increasing Kp often results in increased overshoot, therefore, it appears that not all of the design requirements can be met with a simple proportional controller. This fact can be verified by experimenting with different values of Kp. 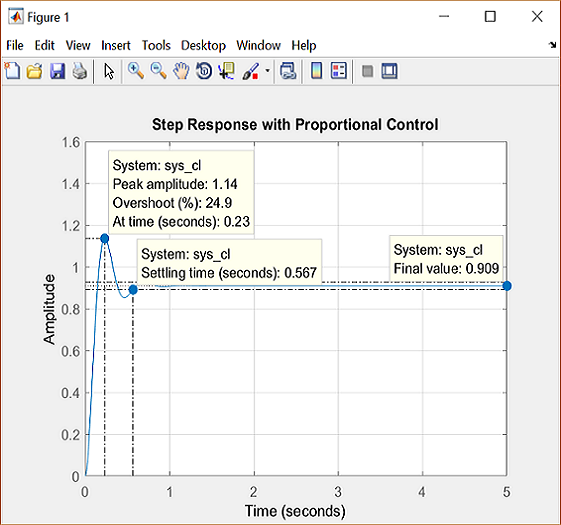 Specifically, you can employ the SISO Design Tool by entering the command sisotool(P_motor) then opening a closed-loop step response plot from the Analysis Plots tab of the Control and Estimation Tools Manager window. With the Real-Time Update box checked, you can then vary the control gain in the Compensator Editor tab and see the resulting effect on the closed-loop step response. A little experimentation verifies what we anticipated, a proportional controller is insufficient for meeting the given design requirements; derivative and/or integral terms must be added to the controller. Recall from the Introduction: PID Controller Design page adding an integral term will eliminate the steady-state error to a step reference and a derivative term will often reduce the overshoot. Let's try a PID controller with small Ki and Kd. Modify your m-file so that the lines defining your control are as follows. Running this new m-file gives you the plot shown below. Inspection of the above indicates that the steady-state error does indeed go to zero for a step input. However, the time it takes to reach steady-state is far larger than the required settling time of 2 seconds. In this case, the long tail on the step response graph is due to the fact that the integral gain is small and, therefore, it takes a long time for the integral action to build up and eliminate the steady-state error. This process can be sped up by increasing the value of Ki. Go back to your m-file and change Ki to 200 as in the following. Rerun the file and you should get the plot shown below. Again the annotations are added by right-clicking on the figure and choosing Characteristics from the resulting menu. As expected, the steady-state error is now eliminated much more quickly than before. However, the large Ki has greatly increased the overshoot. Let's increase Kd in an attempt to reduce the overshoot. Go back to the m-file and change Kd to 10 as shown in the following. Rerun your m-file and the plot shown below should be generated. 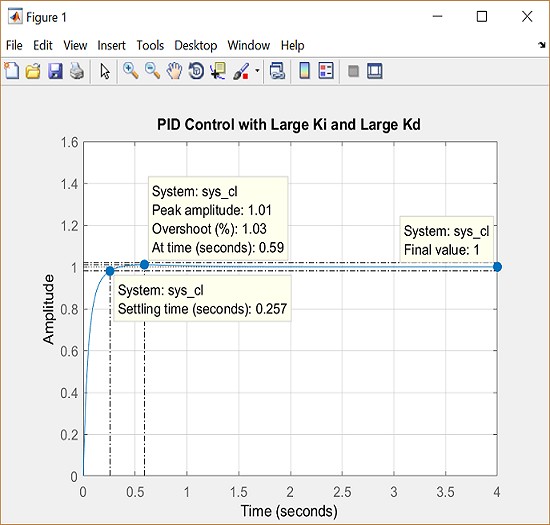 This example shows how to use PID Tuner to fit a linear model to SISO response data. 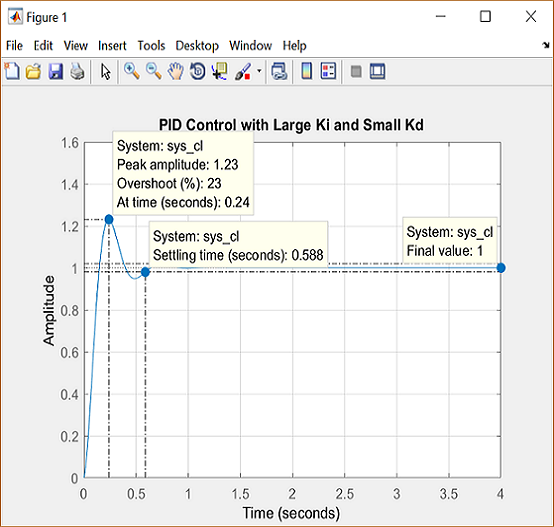 If you have System Identification Toolbox™ software, you can use the PID Tuner to estimate the parameters of a linear plant model based on time-domain response data. PID Tuner then tunes a PID controller for the resulting estimated model. The response data can be either measured from your real-world system, or obtained by simulating your Simulink® model. Plant estimation is especially useful when your Simulink model cannot be linearized. PID Tuner gives you several techniques to graphically, manually, or automatically adjust the estimated model to match your response data. This topic illustrates some of those techniques. In the PID Tuner, in the PID Tuner tab, in the Plant menu, select Identify New Plant. Simulate Data. Obtain system response data by simulate the response of your Simulink model to an input signal. 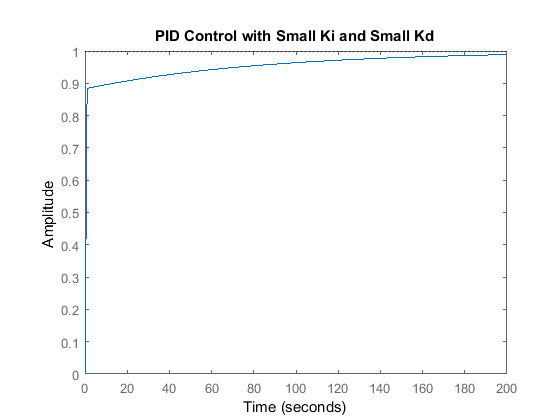 For an example showing how to obtain response data by simulation, see Design a PID Controller Using Simulated I/O Data. Import I/O Data. Import measured system response data as described in Import Measured Response Data for Plant Estimation. Once you have imported or simulated data, the Plant Identification tab displays the response data and the response of an initial estimated plant. You can now select the plant structure and adjust the estimated plant parameters until the response of the estimated plant is a good fit to the response data. PID Tuner allows you to specify a plant structure, such as One Pole, Two Real Poles, or State-Space Model. In the Structure menu, choose the plant structure that best matches your response. You can also add a transfer delay, a zero, or an integrator to your plant. In the following sample plot, the one-pole structure gives the qualitatively correct response. You can make further adjustments to the plant structure and parameter values to make the estimated system's response a better match to the measured response data. Graphically adjust the estimated system's response by dragging the adjustors on the plot. For example, for a one-pole structure, drag the red x to adjust the estimated plant time constant. PID Tuner recalculates system parameters as you do so. In the following sample plot, it is apparent that there is some time delay between the application of the step input (at t = 5 s), and the response of the system to that step input. In the Plant Structure section of the tab, check Delay to add a transport delay to the estimated plant model. A vertical line appears on the plot, indicating the current value of the delay. Drag the line left or right to change the delay, and make further adjustments to the system response by dragging the red x. Adjust the numerical values of system parameters such as gains, time constants, and time delays. To numerically adjust the values of system parameters, click Edit Parameters. Suppose that in this example you know from an independent measurement that the transport delay in your system is 1.5 s. In the Plant Parameters dialog box, enter 1.5 for τ. Check Fix to fix the parameter value. When you check Fix for a parameter, neither graphical nor automatic adjustments to the estimated plant model affect that parameter value. Automatically optimize the system parameters to match the measured response data. Click Auto Estimate to update the estimated system parameters using the current values as an initial guess. You can continue to iterate using any of these methods to adjust plant structure and parameter values until the estimated system's response adequately matches the measured response. When you are satisfied with the fit, click Save Plant. Doing so saves the estimated plant, Plant1, to the PID Tuner workspace. Doing so also selects the Step Plot: Reference Tracking figure and returns you to the PID Tuner tab. The PID Tuner automatically designs a PI controller for Plant1, and displays a response plot for the new closed-loop system. The Plant menu reflects that Plant1 is selected for the current controller design. Tip To examine variables stored in the PID Tuner workspace, open the Data Browser. You can now use the PID Tuner tools to refine the controller design for the estimated plant and examine tuned system responses. You can also export the identified plant from the PID Tuner workspace to the MATLAB® workspace for further analysis. In the PID Tuner tab, click Export. Check the plant model you want to export to the MATLAB workspace. For this example, exportPlant1, the plant you identified from response data. You can also export the tuned PID controller. Click OK. The models you selected are saved to the MATLAB workspace. Identified plant models are saved as identified LTI models, such as idproc or idss. Tip Alternatively, right-click a plant in the Data Browser to select it for tuning or export it to the MATLAB workspace. In many situations, a dynamic representation of the system you want to control is not readily available. One solution to this problem is to obtain a dynamical model using identification techniques. The system is excited by a measurable signal and the corresponding response of the system is collected at some sample rate. The resulting input-output data is then used to obtain a model of the system such as a transfer function or a state-space model. This process is called system identification orestimation. The goal of system identification is to choose a model that yields the best possible fit between the measured system response to a particular input and the model's response to the same input. If you have a Simulink® model of your control system, you can simulate input/output data instead of measuring it. The process of estimation is the same. The system response to some known excitation is simulated, and a dynamical model is estimated based upon the resulting simulated input/output data. Whether you use measured or simulated date for estimation, once a suitable plant model is identified, you impose control objectives on the plant based on your knowledge of the desired behavior of the system that the plant model represents. You then design a feedback controller to meet those objectives. If you have System Identification Toolbox™ software, you can use PID Tuner for both plant identification and controller design in a single interface. You can import input/output data and use it to identify one or more plant models. Or, you can obtain simulated input/output data from a Simulink model and use that to identify one or more plant models. You can then design and verify PID controllers using these plants. The PID Tuner also allows you to directly import plant models, such as one you have obtained from an independent identification task. For an overview of system identification, see About System Identification in the System Identification Toolbox documentation. The dynamical behavior of many systems can be described adequately by a linear relationship between the system's input and output. Even when behavior becomes nonlinear in some operating regimes, there are often regimes in which the system dynamics are linear. For example, the behavior of an operational amplifier or the lift-vs-force dynamics of aerodynamic bodies can be described by linear models, within a certain limited operating range of inputs. For such a system, you can perform an experiment (or a simulation) that excites the system only in its linear range of behavior and collect the input/output data. You can then use the data to estimate a linear plant model, and design a PID controller for the linear model. In other cases, the effects of nonlinearities are small. In such a case, a linear model can provide a good approximation, such that the nonlinear deviations are treated as disturbances. Such approximations depend heavily on the input profile, the amplitude and frequency content of the excitation signal. When operating in a disturbance-free environment, the nominal input of value 50 keeps the plant along its constant trajectory of value 2000. Any disturbances would cause the plant to deviate from this value. The PID Controller's task is to add a small correction to the input signal that brings the system back to its nominal value in a reasonable amount of time. The PID Controller thus needs to work only on the linear deviation dynamics even though the actual plant itself might be nonlinear. Thus, you might be able to achieve effective control over a nonlinear system in some regimes by designing a PID controller for a linear approximation of the system at equilibrium conditions. A common use case is designing PID controllers for the steady-state operation of manufacturing plants. In these plants, a model relating the effect of a measurable input variable on an output quantity is often required in the form of a SISO plant. The overall system may be MIMO in nature, but the experimentation or simulation is carried out in a way that makes it possible to measure the incremental effect of one input variable on a selected output. The data can be quite noisy, but since the expectation is to control only the dominant dynamics, a low-order plant model often suffices. Such a proxy is obtained by collecting or simulating input-output data and deriving a process model (low order transfer function with unknown delay) from it. The excitation signal for deriving the data can often be a simple bump in the value of the selected input variable. Estimate the disturbance component of a model, which can be useful for separating measured dynamics from noise dynamics. Validate estimation by comparing the plant response against an independent dataset. If you need these enhanced identification features, import your data into the System Identification Tool (systemIdentification). Use the System Identification Tool to perform model identification and export the identified model to the MATLAB®workspace. Then import the identified model into PID Tuner for PID controller design. For more information about the System Identification Tool, see Identify Linear Models Using System Identification App.